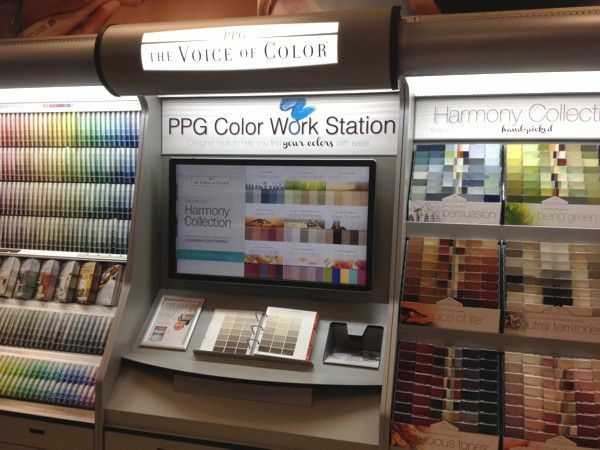 The new Pittsburgh Paints interactive Voice of Color display has redefined how people choice colors for their homes. The traditional color palette has been reorganized and a new LCD interface has made the experience even more personalized. We are the first store in the Pittsburgh area to have this new display from PPG Pittsburgh Paints and are excited at the new features that it brings to the decision making process! Reorganized Color Palette: The new layout of the Voice of Color color palette now makes it easy to find which white-tones work with which brown-tones and vice versa. Once you pick one color, you are able to find other colors that complement what has already been chosen. This is a great help when picking colors for accent walls, doors, or trim. Color trends have been incorporated as well, which help you get inspired and find some winning combinations. New Interactive Display: The entire PPG color collection is viewable through a touch-screen monitor at the Voice of Color display in our store! Through this monitor, you are able to browse every color, scan color chips into the application, get recommendations, and actually place them into a sample room to see how they would look. Once you pick out some of your favorite colors on the display, you can email your project to your home computer, where you can then upload a picture of your room and actually paint the walls virtually! This will give you an idea for what colors work well with your current window treatments, furniture, and carpeting. It also allows for more creativity, so be curious and try all sorts of different color tones; you might just find something that surprises you! All of this can be done with the few clicks of a mouse! Search For Colors At Home: If you don’t have time to visit us in-store but want to become inspired with some color choices, you may now initiate the interactive process from your very own computer. 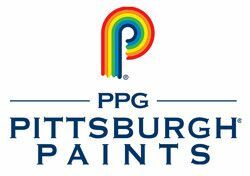 Simply go to www.PittsburghPaints.com and click on the Color tab at the top of the page. Then scroll down to “Paint Your Room Online”. This will open up an application that looks very much like that in-store. Here you will be able to upload a photo of your room, choose colors, and paint rooms all from the comfort and convenience of your home. You can even take a picture of something in your home and let PPG pull similar colors from their color palette to add to your project! Once you find some colors that you like, you can save a snapshot of your room so that you can come back to it later. Next time you are ready to paint, be sure to check out the new Pittsburgh Paints Voice of Color interactive display in our store or on their website! Once you have narrowed your color choices down to one or two, we still recommend that you grab a color chip from our store to be sure that it is perfect. If you would like a larger sample, let us mix a sample quart of paint to the color you have chosen. You can then paint a portion of your wall or a piece of poster board (so that you can move it around the room easily). We also offer color matching directly in-store, so bring us a color chip of the color you desire and our sales clerks will gladly assist you with producing an exact match! Remember, our expert sales clerks in our Paint Dept are here to assist you with all of your paint needs and questions. Save $10 on your next purchase of $50 or more of Manor Hall interior paint from PPG Pittsburgh Paints. Valid through April 30th, 2014. Must print and present coupon at time of purchase. Click here for online coupon.